Fire Arrow is an Ammunition in Dark Souls 3. Shoot arrows with burning tips dealing fire damage. Simultaneously equip up to two types of arrows, and switch between them as needed. Does 25 Physical and 40 Fire damage. Up to 99 can be held on person and 99 in storage. Availble to purchase (100 souls) from Greirat after you free him and make him your follower. 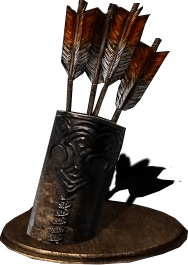 When you use this, you feel like an actual archer, using this along with standard arrows and poison arrows, using each arrow for different situations. This arrow can stun enemies weak to fire, blow up barrels from a distance, and just look plain awesome. Even though its damages combined (normal+fire) are greater than the Large Arrows, it seems to be less effective than them in all cases. Even against enemies with fire weakeness, appart from the stun applied by the fire damage, the overall damage is lesser.So the only use I see for these arrows is to stun fire-susceptible enemies. Other than that, Large Arrows costs half the amount of souls and inflicts more damage. Is there anyway to buy these if Greirat isn&apos;t around at the moment?